FRESHFARM is still a fresh face after 20 years establishing DC, Maryland, and Virginia area farmers markets. Originally launched in 1996 as an American Farmland Trust public education program, Ann Harvey Yonkers and FMC’s Bernie Prince started FRESHFARM’s first market in DC’s Dupont Circle neighborhood in ‘97, and FRESHFARM became its own independent, 501(c)(3) non-profit in 2002. Since then, Dupont Circle has become a staple market in the Mid-Atlantic region, and FRESHFARM has greatly expanded its reach and small farmer opportunity with 14 DC, Maryland, and Virginia markets. 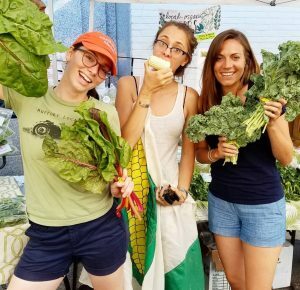 Below, FRESHFARM’s Deputy Director of Communications, Molly Scalise, offers sage promotional advice and divulges FRESHFARM’s diverse programs and events. Head to our Instagram account and witness how FRESHFARM is nourishing the DC Metro area’s food future! Farmers Market Coalition: Give us a little bit of history about your market. Molly Scalise: This is FRESHFARM’s 20th anniversary season. We opened our first market in Dupont Circle in 1997 and this market is widely considered the premier farmers market in the Washington, DC area. We operate over a dozen farmers markets and farmstands in DC, Maryland, and Virginia in partnership with Community Improvement Districts, Business Improvement Districts, and private developers. Our markets are run by a team of paid staff and provide economic opportunities for over 140 farmers and producers in DC, Maryland, Virginia, West Virginia, Delaware, and Pennsylvania, with preference given to producers located within 100 miles of DC. Our markets are strictly producers-only, meaning all products sold at FRESHFARM markets are grown, raised, or produced by the business selling the products. Value-added products and prepared food producers are required to source as many ingredients locally as possible. Our producers sell a wide variety of products, including vegetables, field and tree fruit, pasture-raised beef, bison, pork, chicken, eggs, duck eggs, cheese, yogurt, butter, ice cream, crab cakes, oysters, cookies, cakes, pastries, bread, soups, pastas, prepared foods, pickles, kimchi, sauerkraut, sauces, jams, jellies, syrup, honey, kombucha, cider, beer, wine, locally distilled spirits, and locally roasted coffee. Some of our producers make concessions, selling sandwiches, dumplings, pizza, grass-fed burgers, pancakes, and smoothie bowls. Non-edible items include plants, flower arrangements, leather and wool goods, soap, lotion, lip balm, and other skin care products. All non-edible items made from locally sourced raw agricultural product (for instance, skincare products are made local goat or sheep milks, honey, and herbs). MS: All of our markets are outdoors in urban settings. Most of our markets are seasonal, starting in April and many going as late as December. Our two largest markets in Dupont Circle (DC) and Silver Spring (MD) operate year-round. Our markets offer a wide range of shopping experiences, from bustling weekend markets that draw locals and tourists alike; to mid-size weekday markets near office buildings that target the lunch crowd, or folks looking for something for dinner on their way home from work; to small weekend morning markets in residential neighborhoods. We have locations in many neighborhoods across the city, and are expanding to several new neighborhoods in 2017. FMC: How do you generate neighborhood excitement for your market? MS: Throughout the year, we host a number of programs, promotions, and activities at market to attract new shoppers and engage the community. Under our Food Access program, we run Matching Dollars, which matches what shoppers using federal nutrition benefits (SNAP, WIC, SFMNP) spend at market, up to $10 per market. We also administer Produce Plus (Washington DC markets only), a locally funded incentive program that gives $10 to spend at farmers markets to any city resident receiving federal assistance. Most of our markets have gleaning partners that come every week to pick up any food that farmers didn’t sell and would like to donate. In November, we run the FRESH Food Drive, which raises funds from market shoppers to spend on fresh produce from our farmers, which is then donated to our gleaning partners for Thanksgiving meals for those in need. The Food Drive is a great community event: it’s an opportunity for shoppers to give back, farmers earn extra revenue, and gleaning partners receive fresh, local food for the holiday. It is also a unique opportunity for FRESHFARM to actively engage the public in our charitable purpose. As part of our Education & Outreach program, we run Chef at Market, which brings local chefs, educators, nutritionists, cookbook authors, home cooks, and farmers to market to demo and sample easy, healthy recipes using fresh market produce. Copies of the day’s recipe, as well as many other recipes, are available at the market info tent. Promotions at market include shopper loyalty cards to encourage regular shopping at market, photo contests with prizes, and special events at market throughout the year. Our two largest markets in Dupont Circle and Silver Spring frequently have live music provided by local musicians. Finally, the FRESHFARM Feast is our annual farm-to-table gala event and our biggest fundraiser of the year. The Feast features raw agricultural products provided by our farmers and producers, crafted into a beautiful meal by local chefs. This event celebrates the bounty of our region and directly invests in the food and farms of the Mid-Atlantic watershed. FMC: How do you promote your market? MS: We use a number of different outlets for different purposes. Our weekly e-newsletter includes market picks, events happening at market, community announcements, program updates, a weekly recipe, relevant news articles, and a feature article highlighting programs, specific farmers, interesting crops, or other newsworthy market happenings. We regularly post updates on Facebook, Instagram, and Twitter about market announcements, highlighting new crops that are coming into season, and promoting events. The market info tent has print information about the markets and events, and we have a sandwich board sign to display our brochure, which has information about all the programs we run. Our website also has complete information about our programs and markets. Finally, we publish advertisements in a variety of print and web outlets throughout the year and actively pitch the media with interesting stories about our farmers, markets, and programs. FRESHFARM has good connections with local print, on-air, and online news outlets and we are fortunate to have our market and participating farmers and producers featured regularly in the press. Advice for developing a communications strategy: make a calendar and stick to it. We have a weekly calendar of what we generally post on social media from day to day – for example, highlight a recipe on Thursdays, a farm on Fridays, and a market on Saturdays. This helps with coming up with content and making sure each day’s posts are fresh and different. Also, figure out your goals for each platform and let that guide what you post. We use Twitter and Facebook primarily for announcements, calls to action, and to get the word out to shoppers about what is going on at market. Since Instagram is good for images and not as well suited for calls to action, we use that to platform to build our brand as a resource on local food, cooking, and sustainable agriculture. The e-news is where we capture all the information that needs to go out to shoppers each week, and even if shoppers don’t read it all the time, they know that’s where they can go to find information they may need. Find the mix of platforms that works best for your market, then build your audience with engaging content! We also try to communicate with our farmers and producers as much as possible to find out what they are growing and bringing to market. Some farmers communicate best by text, others via social media, some via email and other want a phone call. Developing really strong channels of communications with our farmers/producers has been an incredibly powerful tool for us – it gives us fodder for all our communication outlets, and ideas for pitches to the media. Our farmers who are very active on social media have, especially over the past year, become excellent FRESHFARM brand ambassadors (amplifying our message). Finally, identify the influencers who shop with you and be sure to cultivate them on social media! Like their posts, thank them for their support, and tag them (where it makes sense!). FMC: What are some of your market’s challenges and successes? Since we have a very limited budget for market promotions, a lot of our efforts are grassroots, working with local businesses and neighborhood associations to help spread the word about a market. We try as much outreach as possible with print collateral (flyering), tabling and community events, and just going into businesses surrounding a market site and introducing ourselves, but it can take years to become fully integrated into a community. Sometimes new markets are not always received well in a neighborhood (we can be seen as a sign of gentrification, a loss of residential parking, or competition for consumer spending). We do our best to offset this with outreach and creating a fun and inclusive market atmosphere that welcomes everyone. We face constant, yearly challenges funding our Food Access (and other charitable work). Matching Dollars is an important way that we make our markets community centers accessible to everyone (and therefore offsetting the previous bullet point), but funding it is a struggle. Although we don’t set the prices at market, we do experience some consumer push back that our markets are too expensive. There is an obvious tension between our non-profit status/need to convert shoppers into donors and the fact that farmers markets (in general) are seen as a very expensive way to grocery shop. With some of the markets that are underwritten by a Business Improvement District or developer, we can run into problems wherein our mission conflicts with what they’d like to see happen at market (mostly in terms of producer line up or programs at work). These relationships can take years to work out but require a mix of diplomacy and sticking to our principals. We are considered the gold-standard for farmers markets in the DC Metro area and are constantly asked to open more markets than we can take on. We’ve incubated many small food businesses that have gone on to open brick and mortar stores. It is so exciting for us to see somebody who starts out making soup out of a church kitchen grow to having three stores and her soups available at Whole Foods in DC, MD, VA, and PA! We are excited to be building a stronger Mid-Atlantic foodshed! Our markets generate approximately $10 million in revenue annually for farmers and food producers and we are really proud of this! Likewise, we love that we can appeal to the food advocate in everyone – shopping with us is an easy, regular way that you can make a difference. This year we are expanding the number of markets we run and the neighborhoods we serve and for the first time opening a market east of the river (Anacostia). Our FoodPrints project, an academically based school garden and cooking program in nine DC public schools, is growing every year to include more schools and students. FMC: Anything else you’d like to add? MS: As a non-profit, FRESHFARM promotes sustainable agriculture and improves food access and equity in the Mid-Atlantic region. We provide vital economic opportunities to local farms and run innovative outreach programs that educate the public about food and related environmental issues. While farmers markets are our most visible program area, we also have three other programs: Farmer Support, Education & Outreach, and Food Access. In addition to the program activities that take place at market, we work to grow our foodshed in the community outside of our markets. FoodPrints integrates gardening, cooking, and nutrition education into the curriculum at partner schools in Washington, DC. Our expert educators teach hands-on, standards-based lessons that get students excited about growing, preparing, and enjoying fresh, local whole foods – and bring science, math, and social studies to life – with the goal of improving health outcomes of children and families. FoodPrints is now in nine DC elementary schools, serving over 3,000 students. Through Farmer Support, we help farmers access money for everything from conference attendance to a loan for a new hoop house. We use our Farmer Fund to help farmers access educational and professional development opportunities. In 2015 alone, we awarded nearly $27,000 from our Fund to support new and innovative farmers with important technical training, connections to professional networks, and access to fellow farmers and artisans. Additionally, FRESHFARM acts as a Kiva trustee for farmers in our network, helping them get access to crowd-funded, zero-interest loans to grow their businesses.